Diet and Stroke | Christoph Gelsdorf, M.D. Trying to get patients to eat better is a fundamental part of being a primary care doctor in Yangon. I’ve written several times about the Mediterranean diet, and am obliged to do so again both because of it’s health benefits and because it seems to apply so well to the food that is available in Myanmar. Research has shown that people who follow a Mediterranean diet are at lower risk of heart disease, cognitive decline and premature death. And now, according to new research, it may also lower the risk of stroke. A large study that is following 104,000 teachers in California divided them up into five categories based on how well they follow a dietary pattern that includes high amounts of fruits and vegetables, whole grains, legumes, nuts and olive oil. Compared to the group that eats these items infrequently, those who were frequent consumers had fewer strokes. The results remained valid even if the two groups were identical in other ways, such as total calories consumed, body weight, exercise habits, and smoking. Last month in Living Well I wrote about women’s heart health. I explained that heart attacks are the number one killer of women globally and that a woman’s chances of having heart disease are greatly reduced by leading a healthy lifestyle. Readers may remember that the article identified stroke as the second leading cause of death in women. So the medical data increasingly supports the notion that eating well can protect you from the top two threats to your longevity. 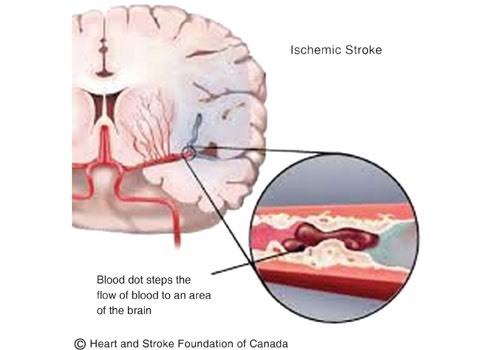 A stroke is caused by a blood vessel in the head suddenly becoming clogged and thereby denying blood and oxygen to part of the brain. When that happens for more than a few minutes, the brain begins to suffocate and die. Much of preventative medicine is trying to understand how to keep vessels healthy so that they don’t become blocked. Healthy food intake, such as that promoted by the Mediterranean Diet, is a key part of protecting the wellbeing of vessels both in the brain and elsewhere. Can people in Myanmar follow a Mediterranean diet? It seems quite accessible to those with enough of an economic cushion to have control over the family unit’s food purchases. Stacks of vegetables, fish, beans, or fruit are plentiful at morning and night street markets. Nuts are easy to find and can be cheap. Burmese cuisine features salads heavy in tomato, eggplant, corn, green beans, and pennywort. Beans and soya are easily available in South Asian dishes and can be found in Shan noodle dishes. Of course, olive oil and wine are expensive, so may be less accessible to most residents. While eating right to avoid stroke and other diseases is certainly possible – and obviously beneficial – the challenge, as with many other healthy lifestyle choices, is getting people to actually do what we know works. Research aimed at understanding which interventions can change behavior is difficult to do and has been generally underfunded. Nevertheless, continuing to advocate for a healthy diet is a fundamental and high yield part of good doctoring.